There is nothing to repair on this doll. It is included on the site because it is an interesting doll and has a story behind its acquisition. The doll was purchased from my sister's friend. It was a left over from the estate sale for the friend's aunt. 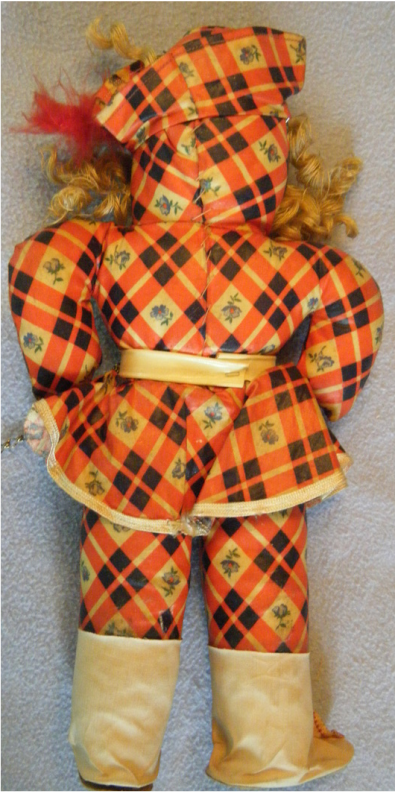 Since it didn't sell in the estate sale, it was being put into a yard sale along with a small assortment of other dolls (including Colonial Dame, Queen for a Day, and Unmarked Wood & Bisque). It was priced at one dollar. My sister was asked to look at the doll and recommend a price. My sister didn't know the actual value but knew that it was worth more to a collector than the asking price. Another of my sisters fell in love with the doll and offered a higher price. The friend accepted the offer and everyone was satisfied. As a result of that transaction, I am able to share the doll with my followers. 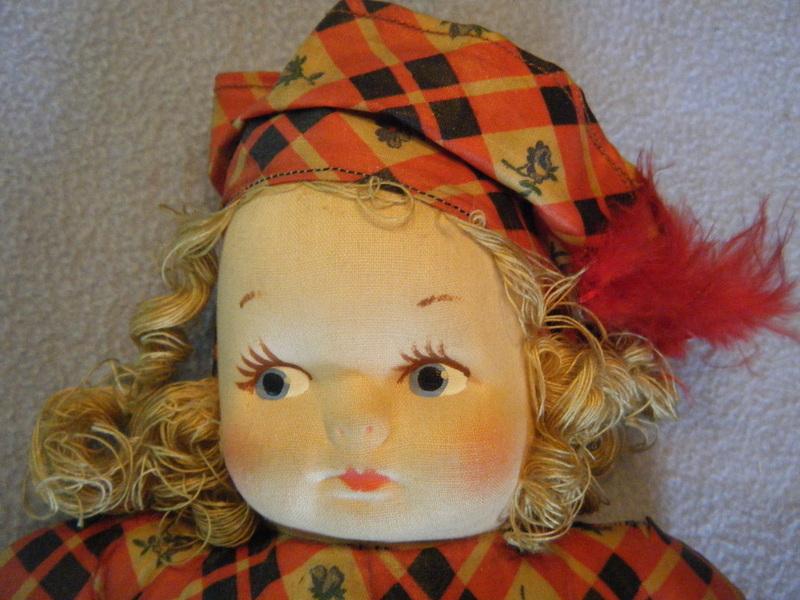 We don't know for sure, but this doll was possibly manufactured by Georgene Averill or Mollye and is likely from the late 1930's to mid 1940's. The doll has a painted cloth face with side glance eyes. Its hair is made from yarn. 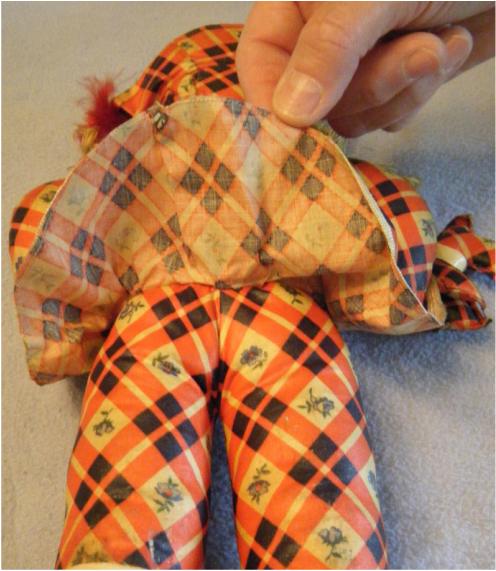 The oilcloth body does not have separate arms or legs and is hand stitched together in the back. The doll has no hands. The boots are oilcloth with paper/cardboard bottoms. Staples are used to attach the belt and boots. 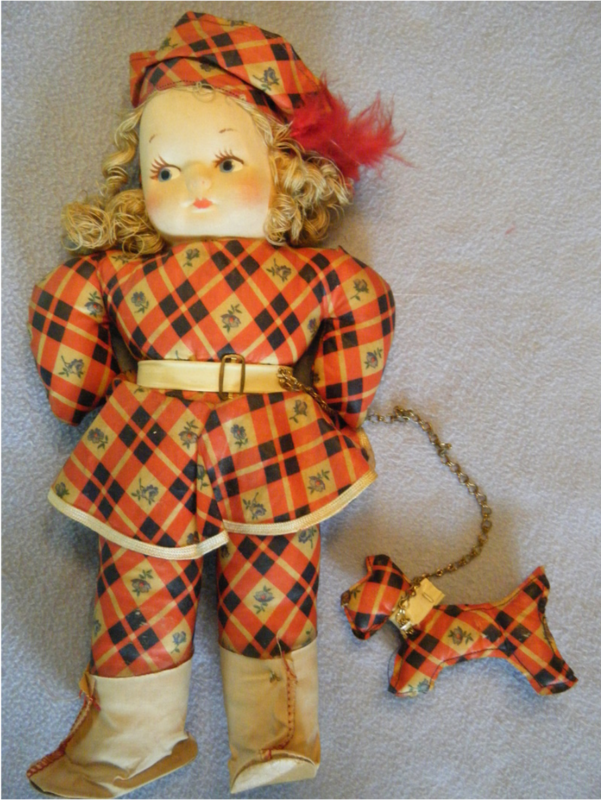 The doll has a Scotty dog made from the same material as the outfit and is attached to the belt of the doll by a chain. The doll has a painted cloth face and an oilcloth body. The plaid pattern is accented with a variety of flowers. The face is in good shape and the painted features and rouged cheeks have held up well. The hair is a fine yarn that has been curled. The hat is accented with a red feather. 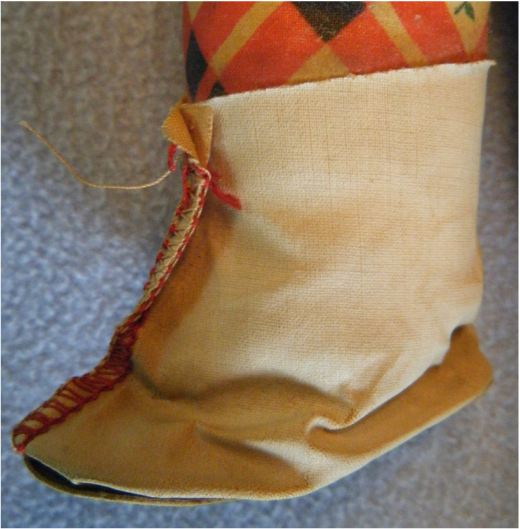 The doll is machine stitched but closed in the back with long whip stitches. The boots are made from oilcloth and stitched in tan and red thread. The boot is not stuffed but just slipped over the footless leg and attached with a long staple. A vinyl-like belt covers the seam joining the skirt to the body. 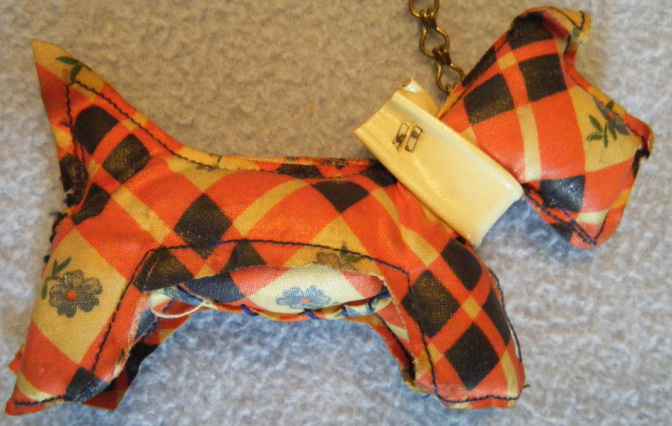 The Scotty dog has four legs and a stapled on collar that matches the doll's belt. 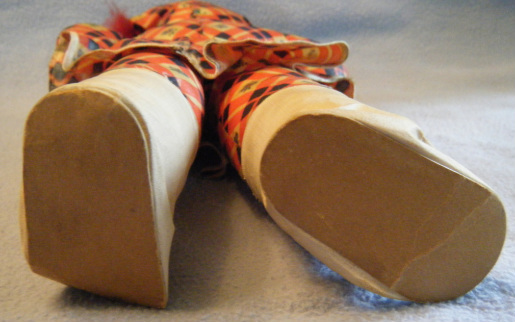 The soles of the boot are made from a heavy paper or card stock and held in place by glue. The soles are slightly worn and creased in a few places.